In terms of installed manufacturing capacity by area, TVs completely dominate because of their large size and volume. Across all displays, over the next three to four years we, as a planet, will approach annual production of around ¼ million square meters (including LCD and OLED displays) in a range of sizes. Around 70% of this is dedicated to LCD TV production, and investment continues to grow this capacity. Whilst there continues to be major investment into OLED display manufacturing capacity for smartphones and smartwatches (particularly in China), the additional capacity in square metres of display for LCD is currently growing more than twice as fast as OLED. Of course that’s mostly because TVs are much bigger than smartphones, but also because TV sizes are growing: the typical purchased TV screen size will continue to increase by around one inch per year over the next five years. Much of this additional LCD capacity is a result of a wave of ‘Generation 10’ display fabs currently under construction or planning. There are around five of these planned at present, each costing in the range of $5-$6 billion to build. These huge factories will use sheets of glass over 3m x 3m in size, which will be cut into multiple large screen TVs, monitors, and digital signs. 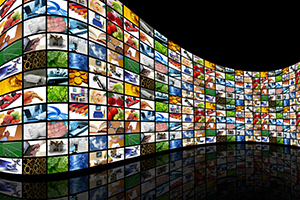 With each Gen 10 line adding around 10 million square meters of display capacity once online, there is expected to be significant oversupply, resulting in squeezed margins as TV prices are cut. Their arrival will therefore unavoidably have an effect on the existing and earlier generations of fabs which will struggle to compete if making the same display specification as the new lines. Owners of Gen 7/8 fabs will already be considering their long term options for these fabs: are there new markets that can be reached using the existing display technology in the fab? If not, can the factory be converted to manufacture differentiated display types to avoid competition? The second question may even lead to innovations that allow these lines to be used for applications beyond displays such as large area sensor arrays. What goes around comes around: The same Gen 8 lines under question today were the cause of similar disruption when they themselves were built: causing Gen 4 and below fabs to be repurposed or sold. Today most operating Gen 4/5 fabs have moved away from manufacturing vanilla consumer LCDs to focus on higher margin applications such as such as automotive and industrial displays, flexible displays, X-ray sensor backplanes and other kinds of large area sensor arrays. FlexEnable’s Organic LCD (OLCD) technology has been designed not only to create new market opportunities and sales avenues for display makers, but also to fit into these factories with little or no Capex requirement. It doesn’t require any special equipment and takes advantage of already established LCD supply chain, meaning it’s the lowest cost flexible display technology today. Whilst the first OLCDs in production will be small- and medium-sized, the same approach can be applied to Gen 7/8 lines for TVs, digital signage and monitors. OLCD has no compromise in optical performance compared to glass LCD, but is built onto plastic films, opening up new product applications and use cases. Its thinness, lightness and robustness combined with its high brightness, long lifetime and scalability make it ideal for small and large area display applications.